A few weeks ago I held a private Cocktails and Appetizers cooking class for 18 ladies who were celebrating two significant birthdays. These ladies regularly get together for fun, laughter, support, travel and a cocktail or two. It was an honor to help them celebrate their birthdays by learning something new in my kitchen. During my classes the most frequently asked question I get is "where do you buy that?" with regard to the various tools and ingredients I use. So with that in mind I wanted to share the class menu with you as well as sources and links to the products and ingredients I use in my recipes. Please note SNFD is an Amazon Affiliate and we may make a small commission when you purchase something through our links. This income helps us cover the carrying costs of our website and we greatly appreciate your support. This is my signature cocktail. Many people tell me they don't like gin until they taste this drink. 99% of the time I have a new gin convert. I garnish with Grapefruit and Aperol Boozy Pops and edible flowers. Fever Tree Tonic Water -- Good tonic makes a difference. I like FeverTree because their tonics are made with natural quinine and sugar, never corn syrup. They make several varieties: including Elderflower Tonic Water, Indian Tonic Water, Mediterranean Tonic Water and Light Tonic Water. You can also buy FeverTree tonic water at Hi-Time Wine Cellar in Costa Mesa, California and many grocery stores. I buy it in the large 500 ml bottles as I like to be generous with my tonic water. I avoid any tonic water made with corn syrup. Trader Joe's has a good tonic water sold in cans that is not made with corn syrup and is priced affordably. Over-Sized Balloon Glasses -- I learned to serve gin and tonics in these oversized balloon glasses at a San Sebastian Bar called Ginotoneria. These glasses are made by Nachtmann Vivendi, a division of Reidel. They are less significantly expensive than most Riedel glasses and amazingly durable given their fragile appearance. Ice Pop Molds -- I use these to make the Grapefruit and Aperol Boozy Pop garnishes as well as a Tequila Lime Boozy Pops that I use to garnish my Mexican Mule cocktail. I use these wooden ice pop sticks. Over-sized ice molds -- I use two different molds. One to make round ice cubes and one for square ice cubes. These large ice cubes look beautiful and they keep your drink icy cold without a lot of dilution. Bitters -- Bitters are the spice rack of your cocktail bar and can dramatically enhance the flavor of your cocktails. The bitter most people are familiar with is Angostura bitters, but there are many different bitters. I use Angostura and either Grapefruit or Orange bitters in my Aperol Gin and Tonics. Many grocery stores and liquor stores sell angostura bitters. For a good bitters selection you are best off going to a specialty liquor store like Hi-Time Wine Cellars in Costa Mesa, California or browsing the options on Amazon. Juniper Berries -- I like to add 5 or 6 Juniper berries to my gin and tonics. Juniper berries are the predominant flavoring ingredient in gin. Note they are there for looks and flavor; do not try to eat them! Edible flowers -- I like garnishing these beautiful cocktails with edible flowers. Pansies and marigolds are both edible. I purchase them at Gelson's supermarket. I also garnish with fresh passion fruit flowers from my garden. I have an article on my Patreon subscription site that tells you everything you need to know about growing your own passion fruit vine. This cocktail uses fresh blood orange juice, which gives it such a spectacular sunset color, silver tequila, and a little St. Germain liquor, which is sold at many liquor and grocery stores. I rim the glass with a mixture of Trader Joe's Chile & Lime Seasoning and a bit of brown sugar. You can also use Tajin, but in my opinion TJ's product is more flavorful and vibrant. This variation on a Moscow Mule is made with freshly muddled cucumber, mint and blueberries. I have used a variety of muddlers but my favorite is this nylon tipped muddler by OXO. It gets the job done without wrecking your wrists and is an essential tool if you love mojitos. The key to a good Moscow Mule and all their many delicious variations is a good, not-too-sweet ginger beer. Trust me there are a lot of yucky ginger beers out there. I like Maine Root Ginger Beer, FeverTree ginger beer and Trader Joe's ginger beer. The key is to get one with a strong ginger flavor that is not too sweet and doesn't use corn syrup as its sweetener. At the end of the class I finished up by demonstrating and serving this delicious dessert martini. It is incredibly simple and is made with a handful of ice and just two ingredients: Van Gogh Dutch Chocolate Vodka and Godiva Dark Chocolate liquor. I buy both at Hi-Time Wine Cellar in Costa Mesa. The trick is to really shake the cocktail vigorously to create little ice shards in your cocktail. These ice shards are considered a no-no for traditional martinis, but I think they are wonderful in this chocolate liquid dessert. I demonstrated four different appetizers for the class. I served the first one as everyone arrived and while I was demonstrating how to make the cocktails. If gazpacho and ceviche had a baby this delicious dish would be the result. I make it several times every summer and it is always a big hit. I like to serve it in these 8-ounce Italian mason jars. They make handy individual servings and they are perfect for taking on a picnic, to the beach, on a boat or just to eat in your back yard. As crab can be expensive I buy 1-pound cans of refrigerated Chicken of the Sea crab at Costco or Trader Joe's to keep the price down. This product keeps for months in the fridge so you can stock up on a can or two. To make things easy I buy frozen shelled and deveined precooked shrimp. This recipe is super simple to make, particularly if you use a food processor to puree the vegetables. It is best when it mellows in the fridge for at least 24 hours before serving. These flavor bomb sandwiches are made 4 to 24 hours before serving and will last for days in the fridge. You start with a loaf of ciabatta bread and slice it in half. Next you pull out as much of the inside of the bread as possible, leaving a bread shell. Smear goat cheese or Boursin cheese on the inside of each half loaf to create a barrier that will keep the bread from getting soggy. Next layer a variety of antipasto ingredients on to one of the bread halves: prosciutto, roasted red peppers, pepperoni, marinated artichoke hearts, salami, provolone slices, etc... and season with a little vinaigrette. Place the remaining bread half on top and wrap tightly in plastic wrap. Place in the fridge and weigh down with bricks to compress the sandwich. Leave in the fridge overnight. When ready to serve add toothpicks and slice into small portions. These tasty nuggets are filling and a little goes a long way. I also have a French Pressed Brick Sandwich recipe that uses cornichons and brie. Tip: I buy all the antipasto ingredients at Trader Joe's, otherwise these sandwiches can quickly become $100 sandwiches! Tabouli is a wheat bulgar salad that is simple to make and is loaded with fresh chopped vegetables and herbs. Simply reconstitute the bulgar in hot water and get out your knife and start chopping. I use tomatoes, red pepper, cucumbers, radishes, green onions, lemon juice, olive oil and lots of fresh mint, parsley and cilantro. I like to finish it with a little Maldon Sea Salt and Aleppo pepper. Wheat bulgar comes in different grind sizes. #1 Fine, #2 Medium, #3 Coarse and #4 Extra Coarse. If you go to a Middle Eastern market you will have many choices. Bob's Red Mill has a medium grind red bulgar I like that is available on Amazon and in many American grocery stores. Hummus -- make your own or dress up store-bought hummus with spices, herbs and olive oil. Sprinkle with fresh fresh or dried herbs, nuts, a little Za'atar or smoked Spanish paprika. Pita bread -- I like to lightly pan grill the pita bread and serve it with olive oil and za'atar. Halloumi cheese -- This delicious pan-fried cheese was a big hit with the class. It is a medieval goat and sheep cheese originally from Cypress. This cheese was traditionally wrapped in mint leaves to preserve it. Halloumi cooks in just a couple minutes and delivers a rich, salty, melted cheese experience. Eat quickly because it will become rubbery as it cools. This is not usually a problem as Halloumi tends to disappear as fast as you pull it out of the pan. Trader Joe's now offers Halloumi cheese affordably priced at $4.99. Olives -- All olives are good, but I particularly like green Castelvetrano olives from Italy. You can buy these at many grocery stores. Roasted vegetables -- You can purchase canned roasted red peppers or make your own. Grilled eggplant and zucchini are nice additions and I highly recommend adding some Slow-Roasted Tomatoes. They will be gobbled up quickly. I used to use plum tomatoes for roasting, but now prefer cocktail tomatoes. They are about the size of a golf ball and typically are sold on the vine. They take less time to roast than plum tomatoes and are the perfect bite-size for a mezze platter. Trader Joe's and Costco sell these for about half the price as regular grocery stores. Grilled kabobs -- If you want to make a serious mezze platter that will be more than adequate for dinner try adding some grilled lamb, beef or chicken kabobs. My recipe for Za'atar and Lemon Grilled Chicken can be adapted for some delicious kabobs. Or check out my recipe for Spiedies. I developed these delicious lettuce wraps after I returned from a trip to Thailand. I had the good fortune to learn from several talented Thai cooks. This recipe uses a balance of Thai flavors including sweet, salty, sour, bitter and hot. I have the butcher make chili-cut ground pork for me using a coarse grind, although a regular grind will work as well. Umami-rich Asian fish sauce is a critical ingredient. My favorite brands are Three Crabs and Red Boat. I hope you enjoyed the menu and notes from my Cocktails and Appetizers cooking class. 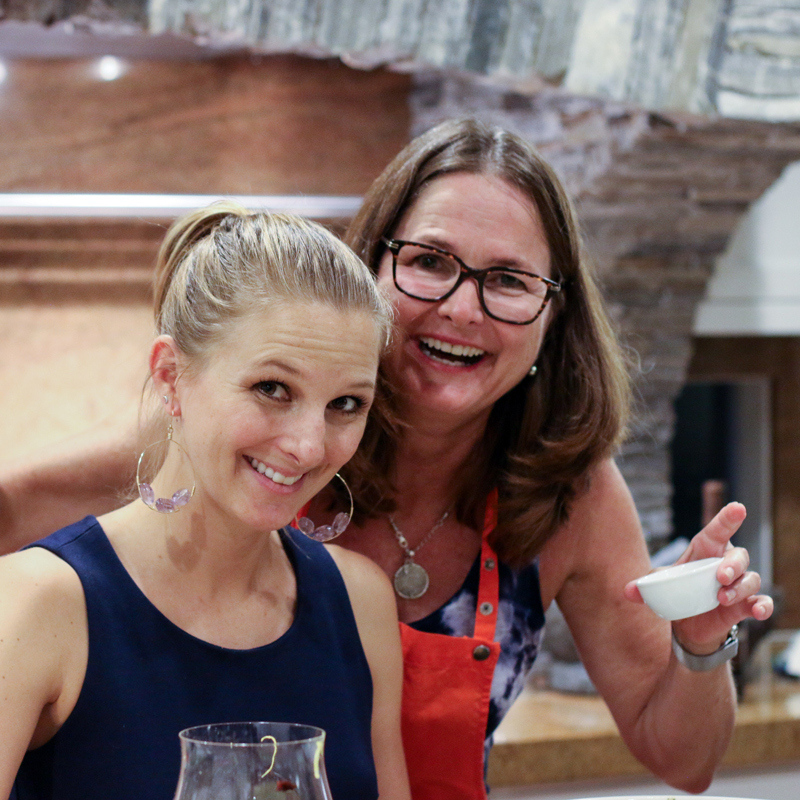 What cooking classes would you like to see in the future? Like What We Do At Something New For Dinner? Sign up for our free every-other Monday newsletters. We send out a couple short newsletters every month highlighting our new and seasonal recipes. Subscribe to our Something New For Dinner Patreon page for more in-depth articles, menu plans, behind-the-scenes activities, sneak peaks and how-to-articles. I also offer priority sign-ups for my cooking classes to Patreon subscribers. Subscriptions start at just $5 a month and we work very hard to deliver more than $5 in value in recipes, tips, time-saving steps, and ingredient sources.